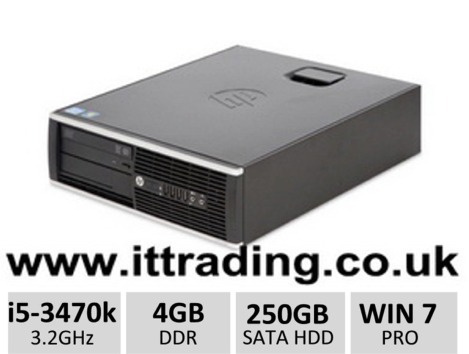 HP 8300 Elite SFF - Small Form Factor Case Design - 3rd Generation Intel Core i5 3470 @ 3.20GHz ( Max Turbo Frequency 3.80ghz ) Quad Core CPU, 4GB DDR3 RAM, 250GB SATA-II HD, SATA DVD-ROM Drive, Hi-Definition Sound & OB Speaker, 1000Mbps Gigabit Ethernet Integrated Network, 10 x USB 4 x 3.0 Ports (on the rear), 6 x 2.0 Ports (4 on the front and 2 on the back),Intel® HD Graphics 2500, Windows 7 COA sticker (no CD). This item has a 10 Kg Delivery Rate. Click here for more information regarding delivery weights and charges.